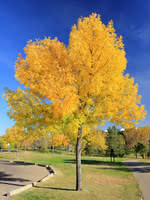 Red Maple is one of the most common and widespread maples in North America. Like its name suggests, Red Maples feature deep red flowers, twigs and seeds, which are especially beautiful in autumn. Red Maple is a great choice for parks and large gardens where there is ample room for its root system. Important note: Red Maple leaves are toxic to horses if ingested in quantity.